The Bontebok is one of the eight species of antelope that canbe found in the Park. It is also the rarest antelope species in the world. 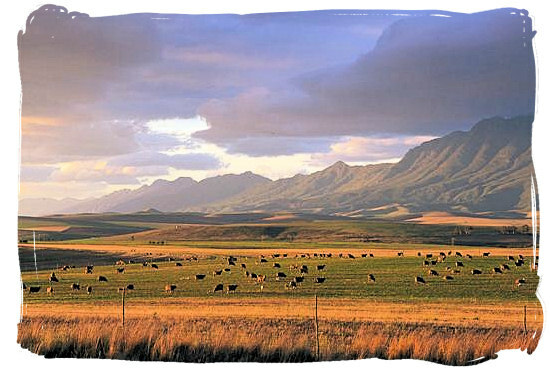 Large herds of Bonteboks used to roam the coastal plain of the Overberg region in the south western part of the Cape Province. Their numbers however were drastically reduced by farmers and hunters and in the early 1900's thespecies teetered on the brink of total extinction. Only 17 had survived on the farm "Guarri Bush" just south of the town of Bredasdorp. 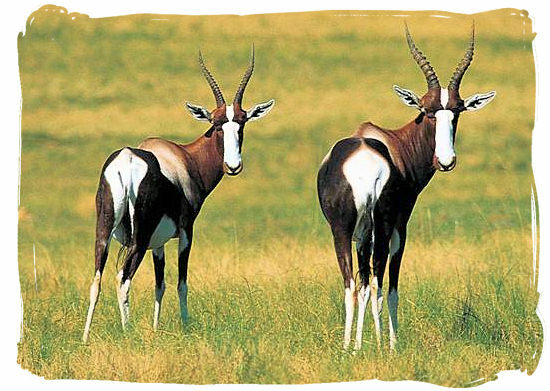 It was here that the first Bontebok National Park was proclaimed long ago in 1931 to protect these last survivors. 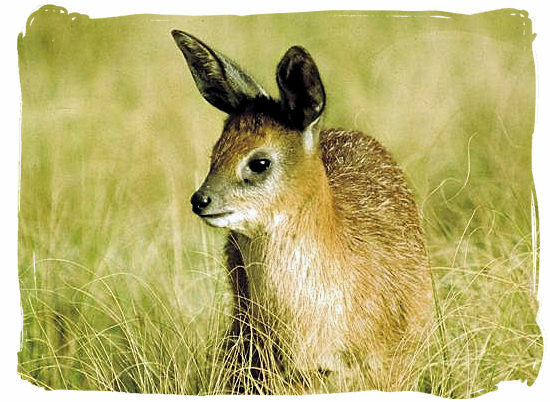 Because of parasitic infections and certain mineral deficiencies, the Bonteboks did not really prosper. 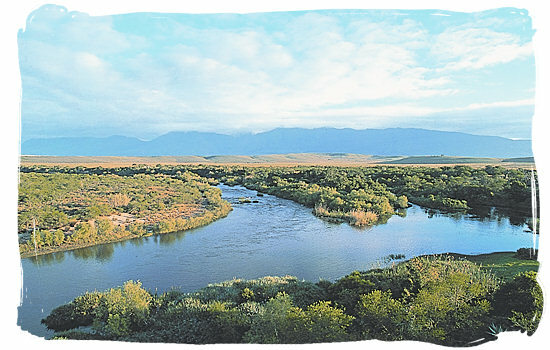 Consequently it was decided in 1960 to relocate the Park to a more suitable habitat on the banks of theBreede river just south east of the town of Swellendam. Situated about 6km south of Bredasdorp near the N2 highway between George and Cape Town, the Park is the smallest and one of the oldest national parks in South Africa. You may not find anything spectacular on your visit to the Park, yet you will be touched by its own unique beauty. 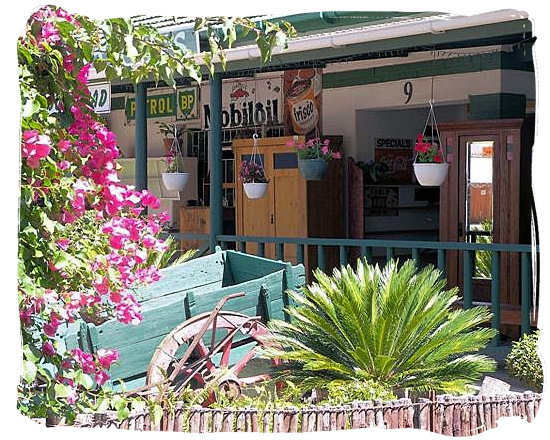 It is a lovely and beautiful nature reserve with a delightful tranquil atmosphere against the backdrop of the picturesque Langeberg mountain range on the one side and the Breede river on the other side. The first inhabitants known to have lived in the Park area was the Hessequa clan of the Khoi people. They were a clan of herders, farming fat tailed sheep and long horn cattle. Every Khoi settlement was controlled by a captain and at times up to 17 captains would set up camp with their nomadic dwellings at the settlement of the most powerful Hessequa chief. The Park’s rest camp, "Lang Elsie's Kraal", is named after one of them, a female chief by the name of “Lang Elsie”, who lived with her clan at the southern part of the Park between 1734 and 1800. The vegetation in the Park consists of "fynbos" and "coastal renoster veld", with many plant species that are found nowhere else in the world. 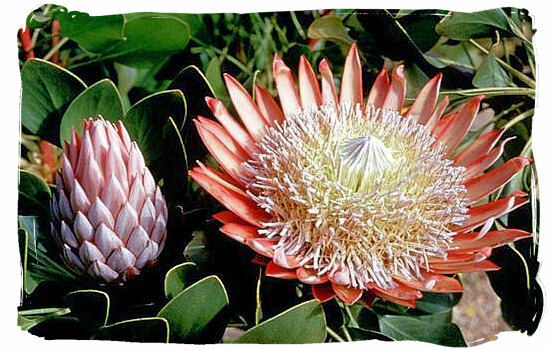 Both are part of the Cape Floral Kingdom which is unique to South Africa and recognized as one of the most biologically diverse of the world's six floral kingdoms. There is something in bloom year round with the peak flower season in the spring. In total, the park has nearly 500 grasses and other plant species. 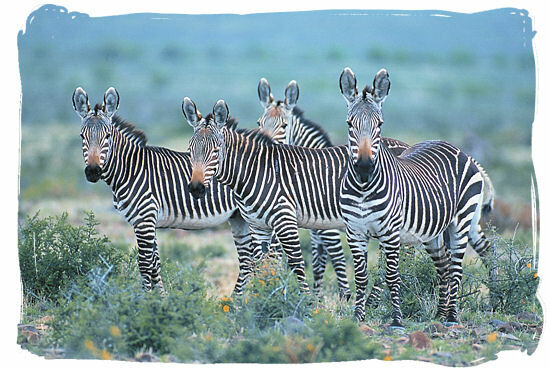 Large herds of Bonteboks used to roam the wide coastal plain of the south western Cape. 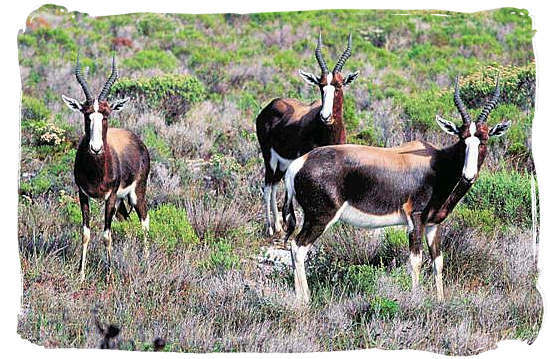 Today the world’s bontebok population totals a mere 3000 animals, of which about 200 are to be found in the National Park. Here, they are joined by the Grey Rhebok, Cape Grysbok, Red Hartebeest, Jackal, Mongoose and other species of antelope as well as a rich diversity of birdlife. 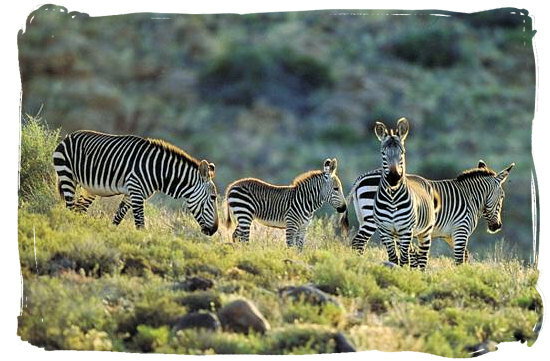 In addition there is a small number of the endangered Cape Mountain Zebra that visitors can see. The Park houses over 200 bird species and is noteworthy as an excellent place to see "Denham's (Stanley's) Bustard". 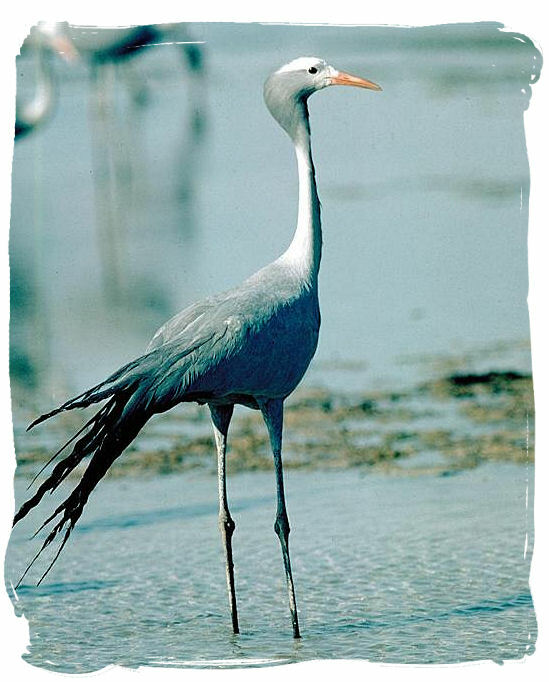 Other large and visible species include "Blue Crane", "Spur-wing Goose", "Secretary-bird" and "Southern Black Korhaan". "Malachite" and "Southern (Lesser) Double Collared Sunbird" should be seen at the reception building. The campsite itself attracts quite a number of species, amongst them are the "Fiscal Flycatcher", "Klaas’s Cuckoo (summer)", "Acacia-Pied Barbet" and "Red-faced Mousebird". Picnic and “braai” (barbecue) sites with ablution facilities are available for day and overnight visitors. A shop at the park entrance supplying basic commodities such as meat, beer, wine and curios. Fresh produce and other groceries have to be bought in the town of Swellendam, which is 6km away. Universal access is a key principle applied in the renovation planning of the camp. The new buildings have ramps throughout and are totally accessible to wheelchairs. Two of the 10 units will be "special-needs adapted" with bathrooms and living spaces which meet current best practice for use by people with special needs. The Bontebok National Park is a great one day visitor location and a perfect stopover when you are en route between Cape Town and the "Garden Route". The Park can easily be accessed from the N2. Because of its fairly small size, visitors can drive around the whole park in a matter of hours and enjoy a picnic, swim, or a small hike to stretch the legs. It also offers passers by and local residents a great “braai” (barbecue) location or a place to take the kids to. 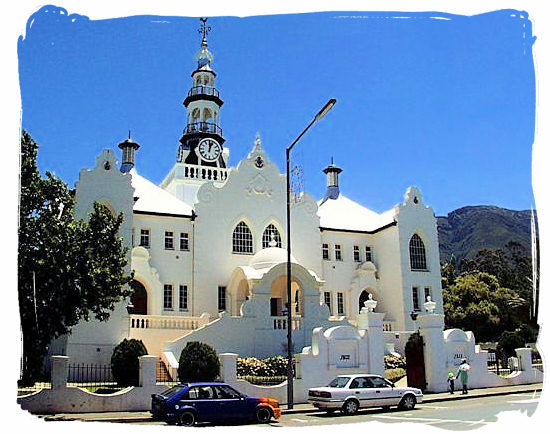 The Park also serves as a useful base from where one can explore wine routes and historical buildings in and around nearby towns such as Swellendam, Robertson, Montagu, Ashton and Bonnievale. The hot springs for which Montagu has become famous for instance, will be a great experience. 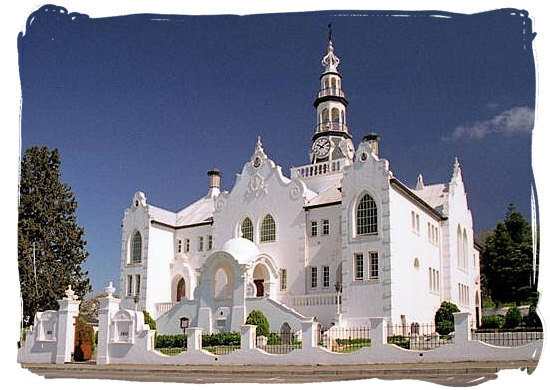 Another example is the Drostdy Museum at Swellendam with its rich historical content showing life at the Cape since the founding of the town in 1745. Firstly of course the beautifully colourful Bonteboks that can be seen roaming the park in their droves. 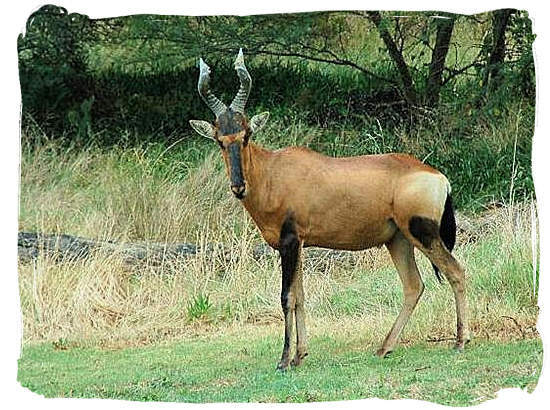 Unusual antelope sightings, including the above-mentioned Bontebok, Grey Rheebok, Red Hartebeest and Cape Grysbok. For Birders to spot the Stanley’s Bustard and over 200 other species of birds that inhabit the park. 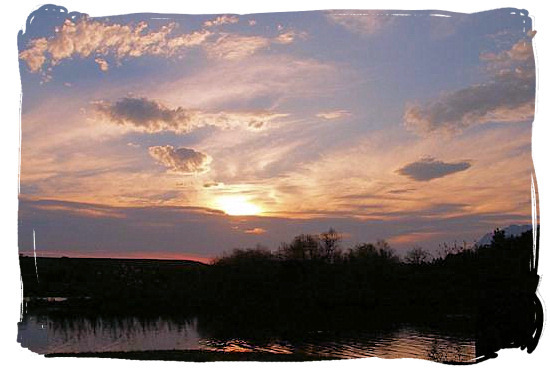 The Breede river, providing the ideal setting for bird watching, fishing and swimming, between exploratory outings into the park. 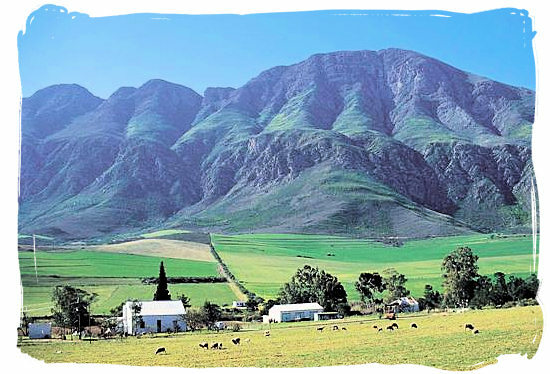 Enjoying a 6-day hiking trail that winds through the Langeberg Mountains and starts in Swellendam. Two short nature-hiking trails, starting and ending in the rest camp area. Bathing in the Breede River in the Rest Camp Area and soon at Die Stroom. Angling in the Breede River, anglers must be in possession of a valid angling permit, available for purchase at Park Reception. Canoeing/Kayaking in the Breede River, with own equipment. The Biking opportunities that are available, regular and mountain biking. Connecting to the people of the past and learn about how the Khoisan lived and changed through local history. 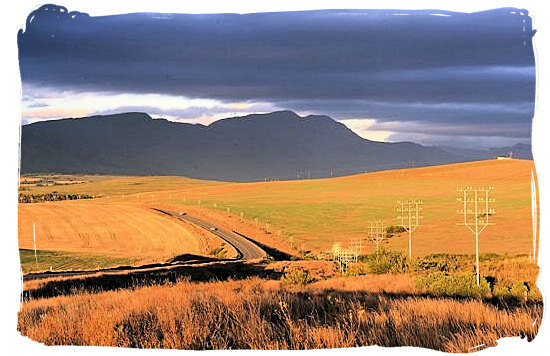 The climate in the Bontebok Park region is temperate with an average rainfall of ± 500mm per annum, occurring mainly during early summer and winter. Temperatures reach up to 40°C in summer and drop as low as 2°C in winter. Go to SANParks.org to view a monthly calendar with accommodation availability details of Bontebok National Park. Go to SANParks.org to view the tariffs applicable for the Bontebok National Park on the official tariff page of the South African National Parks (SANparks) website. Go to SANParks.org to book your reservation for the Bontebok National Park on the official reservations page of the South African National Parks (SANparks) website. The nearest airport is at Cape Town, approximately 240km away from The Park. The alternative is Port Elizabeth, which is 540km away. Flying to Cape Town and travelling by car from there, would probably be the quickest and most convenient way of getting to the Bontebok Park. 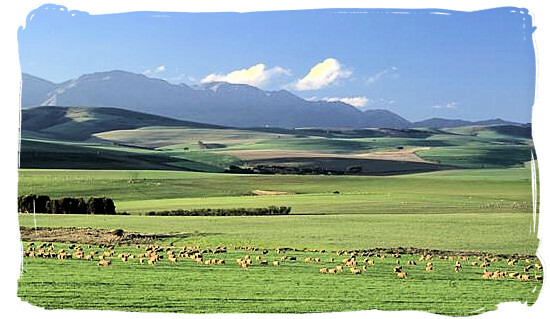 From Cape Town you follow the N2 to Swellendam, until you reach a (brown) sign saying Bontebok National Park just before Swellendam. Turn left onto the gravel road that will take you to the entrance of the Park, a distance of about 5km. At a speed limit of 120km/hr, you should be able to cover the whole distance in about 3 hours. An alternative would be to charter a light aircraft at Cape Town and fly to the Swellengrebel airfield, which is adjacent to the Park, suitable for light aircraft only. Please note that all the internal roads in and around the Park are gravel. 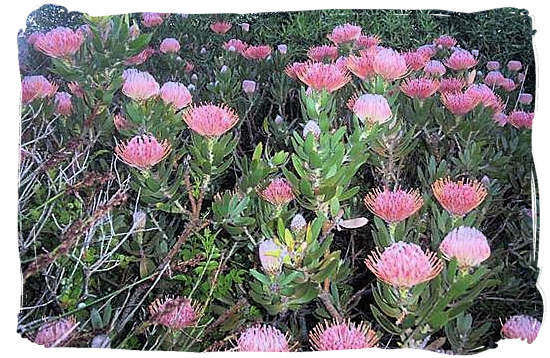 The "fynbos" vegetation in the Bontebok National Park is part of the Cape Floral Kingdom, the smallest of the six floral kingdoms in the world, but biologically the most diverse. It is found in the Mediterranean climate region of the Western Cape province, which extends eastward into the Eastern province. The Cape Floral Kingdom contains 9600 species of vascular plants (plants with vessels for bearing sap), of which about 70 percent are endemic to South Africa, occurring nowhere else on earth. The short video below will give you an idea what this type op vegetation looks like.